WASHINGTON (CNN) -- As Congress comes back after a two-week recess, a national poll indicates the honeymoon may be over for congressional Democrats, although they maintain a decided advantage over the GOP. Congressional Republicans, shown at a press conference this month, have seen only negligible gains, a poll says. Forty-nine percent of people questioned this month in a CNN/Opinion Research Corp. national survey say the country is better off with the Democrats controlling Congress. That's down 7 points from January, but it's 15 points higher than the 34 percent who say the nation would be better with the Republicans running Capitol Hill. Democrats won back control of both houses of Congress in the 2006 elections, and increased their majorities in November's elections. "Most of the Democrats' loss of support has come among younger Americans," said CNN Polling Director Keating Holland. "In January, two-thirds of those under the age of 35 said Democratic control of Congress was good for the country. Now that figure is down to 48 percent." The poll also indicates that 62 percent of those questioned think President Obama is doing enough to cooperate with Republicans. That's down eight points from February, but it's 25 points higher than the 37 percent who feel the Republicans in Congress are doing enough to reach out to Democrats and the president. "Traditionally, the public likes to see bipartisan cooperation in Washington," Holland said. "So, the perception that the GOP isn't reaching across the aisle may be holding the party back in its efforts to capitalize on discontent with the Democratic track record so far." 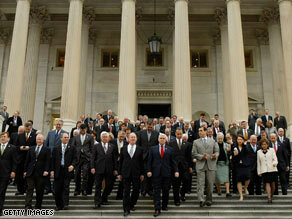 Congress reconvenes this week after Easter recess. Both houses will be in session for five weeks until they break for Memorial Day. Commentary: Will Obama, GOP make a deal? On the agenda: final passage of the budget, which could happen as early as the end of next week. Both houses passed separate versions of the budget bill before the recess. Congress also will start the long and difficult process of health care reform, with the hopes of finishing before the August recess. The equally hard battle over energy reform is also expected to get under way. Lawmakers need to vote on an $84 billion supplemental request by the Obama administration to fund the wars in Iraq and Afghanistan. A housing bill that would allow judges to rewrite mortgage payments for Americans facing foreclosure has passed the House, but could face a fight in the Senate. Also on the agenda: The House may take up banking regulations, and the Senate will hold confirmation hearings for Obama administration secretaries and undersecretaries. The poll indicates that most Americans don't think lawmakers are doing a good job. Sixty-three percent disapprove of how Congress is handling its job, with 35 percent saying they approve of what lawmakers are doing. That mark is six points higher than in February, when only 29 percent approved of how Congress was handling its job. "The increase in overall views of Congress is due mostly to Democrats," Holland said. "Democrats nationwide have seen Congress pass a Democratic president's initiatives for the first time since the 1990s and they are responding accordingly. Nonetheless, most Americans still don't have a very positive view of Congress." The CNN/Opinion Research Corp. poll was conducted April 3-5, with 1,023 adult Americans questioned by telephone. The survey's sampling error is plus or minus 3 percentage points. CNN's Craig Broffman and Ted Barrett contributed to this report.